Black Panther grabs multiple 2018 Golden Globe nominations! Check out the latest song from the Spiderman: Into The Spiderverse soundtrack! If you're in Philly, stop by Amalgam Comics & Coffeehouse to meet the writer of Marvel's new series, Ironheart! "If you are unfamiliar with the MCU or even want to brush up on a few of the finer details of this film franchise universe, this is the book for you." 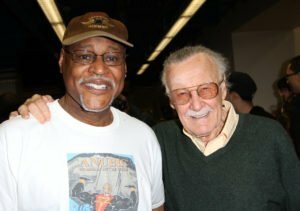 BlackSci-Fi.com columnist Professor William H. Foster III shares his thoughts about acclaimed comic book creator Stan Lee. Celebrate Ten Years of Cinematic Superheroics in style!